Shorten the cord on your earbuds or in-earphones by simply taking a few wraps around your Slack-Up cord winder to reduce the annoyance of too-long earphone wires that constantly get in your way. No more tangled-up headphones. Very Cool! Perfect for backpacks and purses. 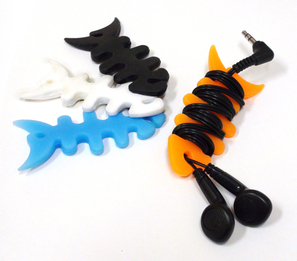 Slic-Sound Earbud Enhancers for Improved Sound and Fit! Got Ears? Slack-Up Cord Winder4CJOctober 13, 2017These are simple to use, keep the excess cord contained and do exactly what they were designed for. They are made of a durable material and have held up under use. The product is a bit larger than I expected (1"x 3") which is what brings the rating down for me. If the design were more compact, maybe 2/3 the length but about the same width my rating would be higher. Got Ears? Slack-Up Cord Winder5E.AbeDecember 22, 2011I've ordered one of these as an attempt to get my rid of my always tangling earphone cord, which sometimes get stuck when I move. The product is quite simple but it does the job quite well and the price is fair IMO.